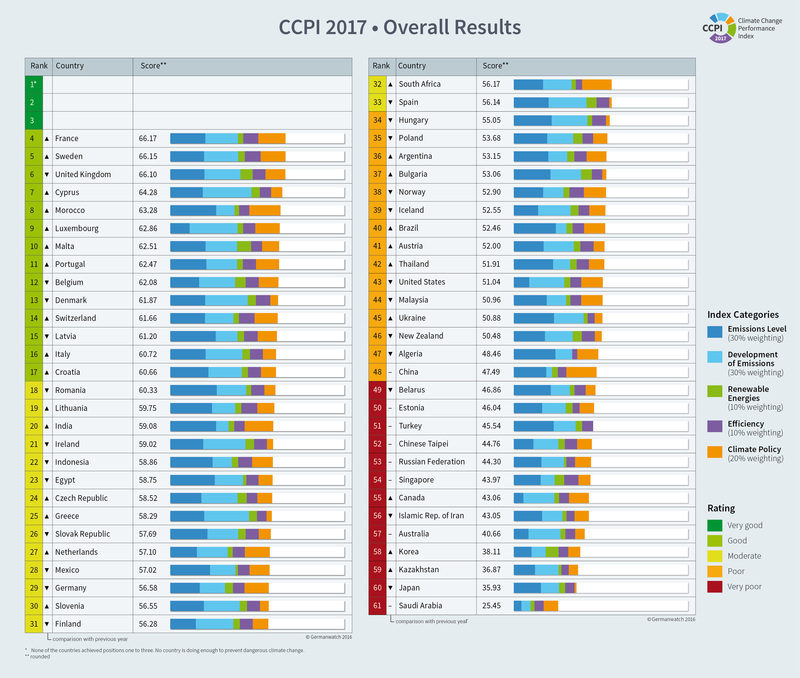 Every year the Climate Change Performance Index evaluates and compares the climate protection performance of 57 industrialised and developing countries. The Climate Change Risk Index on the other hand analyses to what extent countries have been affected by the impacts of weather-related loss events like storms, foods heat and alike. The Climate Change Performance Index is an instrument supposed to enhance transparency in international climate politics. Its aim is to encourage political and social pressure on those countries which have, up to now, failed to take ambitious actions on climate protection as well as to highlight countries with best-practice climate policies. On the basis of standardised criteria, the index evaluates and compares the climate protection performance of 58 countries that are, together, responsible for more than 90 percent of global energy-related CO2 emissions. The Climate Change Performance Index is an instrument supposed to enhance transparency in international climate politics. On the basis of standardised criteria, the index evaluates and compares the climate protection performance of 58 countries that are, together, responsible for more than 90 percent of global energy-related CO2 emissions.